Molecular imaging technologies are playing an important role in neuroimaging, a branch of medical imaging, by providing a ‘window’ into the living brain. Where CT and conventional MR imaging provide important structural and anatomic information on the brain, molecular imaging (MI) technologies allow scientists to visualize and measure brain function. What is molecular imaging and how does it help people with brain disorders? As disease progresses, this abnormal cellular activity begins to affect body tissue and structures, causing anatomical changes that may be seen on CT or MRI scans. For example, cancer cells may form a mass or tumor. With the loss of brain cells, overall brain volume may decrease or affected parts of the brain may appear different in density than the normal areas. Similarly, the heart muscle cells that are affected stop contracting and overall heart function deteroirates. What molecular imaging technologies are used in neuroimaging? Positron emission tomography (PET) and single-photon emission-computed tomography (SPECT) are the most commonly used molecular imaging technologies for the brain. Once the FDG radiotracer accumulates in the body’s tissues and organs, its natural decay eventually produces photons. The PET scanner, which is able to detect these photons, creates three-dimensional images that show how the FDG is distributed in the area of the body being studied. More active cells accumulate more FDG tracer. Areas where a large amount of FDG accumulates, called ‘hot spots’ because they appear more intense than surrounding tissue, indicate that a high level of chemical activity or metabolism is occurring there. Areas of low metabolic activity appear less intense and are sometimes referred to as ‘cold spots.’ Using these images and the information they provide, physicians are able to evaluate how well organs and tissues are working and to detect abnormalities. 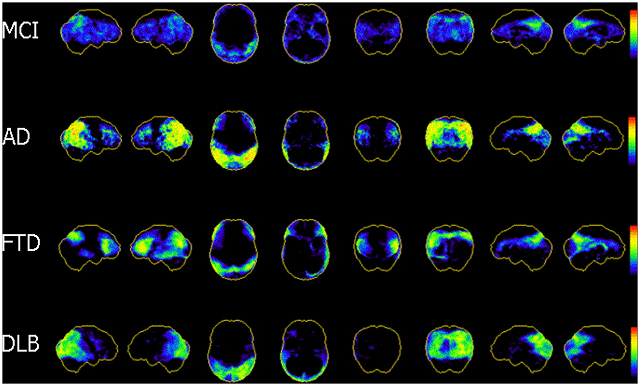 Researchers are exploring the use of additional neuroimaging probes, including FDDNP and amyloid markers, which bind to the abnormal plaques and tangles associated with Alzheimer’s disease and allow them to be visualized on a PET scan. In addition to dementia, PET scanning is used to diagnose other brain disorders that cause changes in metabolism and blood flow. For example, an area of decreased glucose metabolism may indicate the source of epilepsy or a stroke. Abnormal patterns of glucose metabolism and an accumulation of amino acid may signal the presence of a brain tumor. Like PET, SPECT also can be used to differentiate different disease processes that produce dementia and it is increasingly used for this purpose. SPECT also plays an important role in epilepsy imaging and the surgical treatment of severe epilepsy. What are the advantages of molecular imaging for people with brain disorders? molecular imaging allows metabolic activity to be directly visualized, not inferred. PET and SPECT studies allow abnormal brain function to be detected before structural changes can be seen on CT or MRI. PET and SPECT scans are able to detect the early onset of neurological disorders such as Alzheimer’s disease and is highly useful in detecting specific types of dementia, such as Alzheimer's disease and frontotemporal dementia, e.g., Pick's disease. PET and SPECT are highly accurate methods of pinpointing areas of the brain causing epileptic seizures and for evaluating surgery as a treatment option. molecular imaging is very useful for guiding the management of brain tumors. Physicians use PET and SPECT studies to determine the extent of the disease, define the degree of malignancy and to detect cancer recurrences. 18F-FDG PET scans of patients (average age 65.5) with mild cognitive impairment (MCI), Alzheimer's Disease (AD), frontotemporal dementia (FTD), and dementia with lewy bodies (DLB). 18F-FDG PET scans are used to diagnose neurodegenerative diseases. Is molecular imaging covered by insurance? Medicare and private insurance companies cover the cost of many molecular imaging technologies. Check with your insurance company for specific information on your plan. What is the future of molecular imaging and neuroimaging? Important research underway includes the National Institute on Aging’s Alzheimer ’s Disease Neuroimaging Initiative (ADNI), which is following hundreds of cognitively healthy individuals and others with mild cognitive impairment (MCI) and early Alzheimer’s disease (AD) over at least five years. Participants will undergo annual MRI and PET scans so that researchers can assess changes in both the normal aging brain and in individuals with MCI and AD. By correlating these images with other test results from the study’s participants, such as cognitive evaluations and fluid and urine samples, researchers hope to identify valuable biomarkers of the disease process. assess patient response to drug treatment. Recently developed radiotracers for PET and SPECT allow for earlier and more accurate diagnosis of Parkinson’s disease and will be available to help physicians and patients in the near future.